The Directorate General of Migration (DGM), informs that migration control operations were conducted, following intelligence work and complaints from the Dominican population regarding the presence of Haitian illegal, in different sectors of the provinces of different areas of the provinces of Azua, Barahona, Espaillat, La Altagracia, La Vega, Montecristi, Santiago de los Caballeros, San Cristobal, the National District and the Municipality of Santo Domingo East. Migration control teams were composed of inspectors, agents of the Directorate General of Migration (DGM) with the support of the military, the National Police in coordination with the Public Ministry of the Provinces concerned. 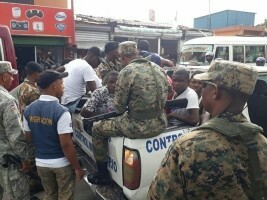 1,522 Haitians were controlled during these operations and 1,126 (74%) were declared irregular and led to the border posts of Dajabón and Elías Piña, to be registered and deported to Haiti in accordance with the provisions of Law 285-04.